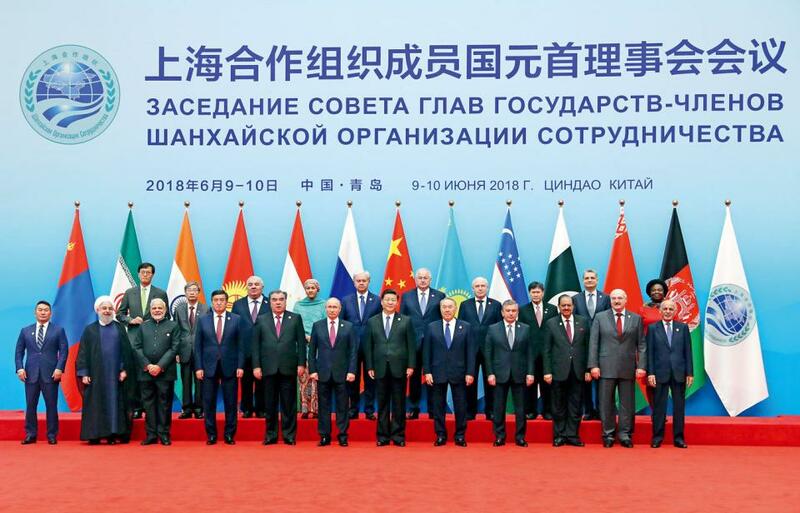 On June 9, the day the G7 summit ended in Charlevoix, Canada, Chinese President Xi Jinping welcomed leaders of members states of the Shanghai Cooperation Organization (SCO) to Qingdao, China, for the 18th SCO summit. The two-day summit culminated in the Qingdao Declaration and an agreement on promoting trade facilitation. In total, 17 documents were signed, including six agreements on cooperation in various fields. rising terrorism in the region. For some time, the significance of the SCO had been limited by its modest membership. But since India and Pakistan joined the group as full members in 2017, the group’s eight member states account for 40 percent of the world’s population, 20 percent of its GDP and one-third of its trade. With Mongolia, Iran, Afghanistan and Belarus as observer states – and another six dialogue partners including NATO partner Turkey – the influence of the group has grown. “The SCO is now a cross-regional organization,” SCO Secretary-General Rashid Alimov, Tajikistan’s former ambassador to China, told the summit. “The SCO summit in Qingdao is surely an important global event, not only for the vast region from the Arctic to the Indian Ocean, from the Pacific Ocean to the Baltic Sea that it covers, but also for the whole world,” Alimov said. According to Deng Hao, secretary general of the China Center for SCO Studies, having China, India, and Russia – the world’s three major emerging countries – in the framework gives the bloc greater strategic significance. With the commitment China has shown during the Qingdao summit, “the group has entered a new phase after 17 years of development,” Deng told NewsChina. Regional security remained the primary focus of the Qingdao summit. According to a report on the SCO’s development over the past 17 years released by the Renmin University of China and Lanzhou University in May, between 1990 and 2001, separatists from the so-called “East Turkestan” movement had launched more than 200 attacks in the Xinjiang Uyghur Autonomous Region, leading to the death of 162 civilians and injuring more than 440. But after the SCO was established in 2001 with a new agreement on fighting cross-border terrorism, separatism and extremism, violent attacks have greatly reduced and the security situation in China’s northwest has improved, especially in Xinjiang. During the summit, a new agreement was signed, laying out a 2019-2021 program of cooperation for combating the “three evil forces” of terrorism, separatism and extremism, along with other agreements regarding intelligence exchanges, drug trafficking, cross-border organized crime and cyber-crime. While security remains a core issue, the SCO’s agenda in Qingdao expanded to new economic and cultural issues. Improved regional security has led to strengthened economic cooperation between member states, which has become another major focus of the bloc. When the SCO was officially established in 2001, the trade volume between China and other SCO members was US$17.4 billion. By 2017 it had increased to US$217.6 billion. Setting aside trade between China and the two newest members, India and Pakistan, trade between China and the five original SCO member states reached US$117.1 billion alone, more than six-and-a-half times the 2001 level. As SCO members are covered by China’s Belt and Road Initiative, an ambitious project aimed to link the Chinese economy with major continental and maritime areas of the Eurasian continent through financing infrastructure building in the region, it is no surprise the SCO is serving as another multilateral platform for China to push forward its vision for the region’s development. While the Qingdao Declaration does not specifically mention China’s Belt and Road Initiative, and other countries have their own economic initiatives for regional development, the rationale behind these initiatives and the Belt and Road appears to be the same – promoting trade and investment through infrastructure building. At the summit, China announced it would establish a 30 billion yuan (US$4.7 billion) special lending facility within the framework of the Interbank Consortium of the SCO. In recent years, China launched the Asian Infrastructure Investment Bank (AIIB) and the Silk Road Fund. SCO member states are also members of the AIIB. In the first quarter of 2018, trade between China and other SCO members saw a further year-on-year increase of 20.7 percent, and China’s combined investment in other SCO member countries reached US$84 billion by the first quarter of 2018. According to Deng Hao, China’s initiatives under the Belt and Road suggest the trade facilitation agreement signed at Qingdao will serve as a driving force for economic cooperation between member states in coming years. Besides concrete issues such as security and economics, the parallels between the SCO summit and the G7 summit – which was held on June 8 and 9 and failed to agree on a joint statement – are seen as symbolic by some analysts. “The Shanghai Spirit, transcending outdated concepts such as the clash of civilizations, Cold War and zero-sum mentality, has opened a new page in the history of international relations and gained increasing endorsement of the international community,” Xi said. A “new-type” of international relationship is a break from the “old-type” of international relationship dominated by US-led military alliances. With the idea of “common destiny,” China brands its approaches to various issues as “win-win” solutions, in contrast to what it calls the “Cold-War mentality” and “zero-sum mentality” of the West. The message is conveyed clearly in Xi’s speech. “While hegemony and power politics still persist in this world, the growing call for a more just and equitable international order must be heeded. Democracy in international relations has become an unstoppable trend of the times,” Xi said. According to Deng Hao, with an expanded scope and strong commitment from China, the SCO is now eyeing a grander mission of promoting a fair and just global order. Not only does the Qingdao Declaration assert that the bloc will “oppose fragmentation in world trade relations and any form of trade protectionism,” it also goes beyond the sphere of its own members to address some key global issues. It says, for instance, that the “Korean Peninsula issue must be resolved through dialogue and consultation.” It voices support for continuation of the Iran nuclear deal, and asserts that “an Afghan-owned and Afghan-led peace and reconciliation process” is the only way to resolve the Afghanistan issue. While these statements are broad and in principle, they may reflect the more active global role the SCO could play in the future.